15 Days. 15 Affirmations. Take the 15-Day Affirmation Challenge! 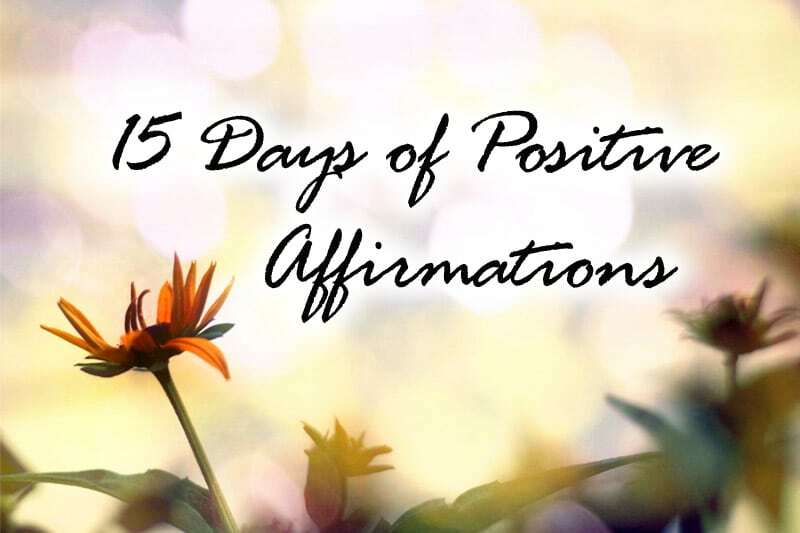 This is the announcement post for the 15-Day Affirmation Challenge, where hundreds of participants around the world gather to practice positive affirmations for 15 days in July 2014. The challenge is now over, but you can do the tasks in your own time. Visit the overview page for all Affirmation Challenge tasks and posts. I’m in control of what life brings me. I’m grateful for all that I’ve been given in life and will continue to receive in the future. Have you heard of these statements before? Called affirmations, these are empowering declarations that one repeats to oneself every day to enforce certain positive beliefs. Some people write down their affirmations at a fixed time every day and read them out loud; some repeat their affirmations as part of their morning ritual before starting their day; some meditate over their affirmations and visualize them coming true in their reality. [Using affirmations is] an extrinsic, outside in approach [to build self-confidence], where you adopt actions to induce confidence. [It’s] the most popular method within the self-help community and also the quickest method to get results. [While affirmations] are efficacious because they give you a confidence boost almost immediately after you do them, the effects are rarely long-lasting — you need to repeatedly remind yourself to do them, otherwise their results will dissipate over time. Affirmations, when used singly, is no different from hopping around with a wooden staff and (to quote PE reader Diana Diehl) singing kumbaya at 8 am every morning thinking that these actions will make your problems go away and automatically attract success into your life. Unfortunately, they won’t. Problems can only be tackled through conscious self-reflection and direct action, not by saying affirmations only. However, where affirmations help is that they help us to re-image the future (especially if we are fixed on a particular way of thinking), reinforce positive beliefs, and remind us of who we can be. Affirmations have their merit, and they can be even more powerful when followed up with the right questions and planning. And this is precisely what the upcoming affirmation challenge is about!! Introducing: 15-Day Affirmation Challenge for July 2014! I’ll post one affirmation task on PE every day, in the form of a blog post. Subscribe to PE newsletter to get all updates on time!! The tasks are not just about saying positive affirmations, but about conscious self-reflection and planning as well. Remember, saying affirmations alone is no different from singing kumbaya (i.e. self-delusion) — you need to follow up with action steps to create change in life. I’ll walk you through how to do this with each day’s task, not to worry! Share your daily results with others. At the end of each day, share your results in the comments section for that day’s task. Read other participants’ results, share your thoughts with them, and interact with each other! It’s all about doing this together as a community! There will be a break day every seven days, to reflect on the past affirmations and to prepare for next leg of the challenge. As this is a 15-day challenge, there will be two break days on July 14 (Monday), and July 22 (Tuesday). The challenge ends on July 24, after 15 affirmation tasks, where I’ll post a roundup for your final reflections, feedback, as well as to create your plan moving forward. And the best thing?? Participation is 100% free! 😀 Simply follow these three simple steps to join! Reply to this post now with your intention to sign up! Post your comment here: 3 Simple Steps to Sign Up. Subscribe to the FREE PE newsletter to receive all challenge updates via email! Sign up here: Free PE Newsletter. (Note that the subscription doesn’t work retroactively. If you are subscribing after Day X, you will only receive the challenge updates posted after Day X.) To get challenge updates on other media as well, follow me on Facebook, Twitter, and subscribe to my free RSS feed. I don’t care if you use a fake name and use an animal avatar for this challenge — JUST SIGN UP. It’s about being proactive about your growth, voicing your intent to the universe, and being here in this international community of conscious individuals to pursue your growth. Where else can you find something like this, and for free to boot? Stop hiding in the shadows and participating by virtue of “reading” the tasks. You can’t believe how many messages I get after each past challenge from lurkers who told me that they wished they signed up from the beginning. The free challenges at PE are typically held only once, after which they are archived for self-administered participation. This is your best chance to join the challenge and join other conscious individuals to further your growth! Spread the Word!! Let Others Know of Your Participation!! Why should you spread the word? Firstly, I’ve specially designed this challenge for you and made this available for free, so it’s just my tiny request that you spread the word to others, in hopes that we can share this growth opportunity to others who may not know about PE yet. Be it one or ten people, I’m grateful as long as you can share with someone. Whether they join or not is their own choice; what matters is that we let them know of this opportunity. Secondly, the success of this challenge is highly dependent on the number of people we can get on board. The more people in this challenge, the stronger the community effect, the more you benefit as a participant. It’s not a zero-sum game where having one more participant means less benefits for the rest; it’s a synergistic challenge where more participants means more success to all of us. Blog About Your 15-Day Affirmation Journey! For those of you who run a blog, I encourage you to blog about your experience on the challenge! Share about the Affirmation Challenge with your readers, then write about your experience with each task starting from Day 1. This will add a layer of accountability for yourself, and also let you serve as an inspirational example to your own readers as they see your results from performing each act of gratitude! In fact, as an incentive and encouragement to all of you blogging about your affirmation journey, I will be showcasing your blog URLs here! By having your blog listed here, it will also give PE readers ideas on how they can go about doing their Affirmation Challenge and help inspire them to be better people through your writing. Update on July 26, 2014: The Affirmation Challenge is now over, and I thank all of you for your wonderful participation! While the challenge is over, you can still do it in your own time.